Wildlands was honored to be a part of the Hoosier Dam Removal project, which successfully removed a reinforced concrete dam that measured 235 feet long by 25 feet tall. As a result, the project reconnects designated critical habitat for the Cape Fear Shiner (a federally listed endangered species) and other species of concern on the Rocky River and Bear Creek within the Cape Fear River basin. The dam removal project was completed courtesy of a NFWF grant. The project team included Unique Places, LLC, Wildlands Engineering, Schnabel Engineering, and New South Associates. Wildlands was responsible for the permitting, design, and construction oversight. 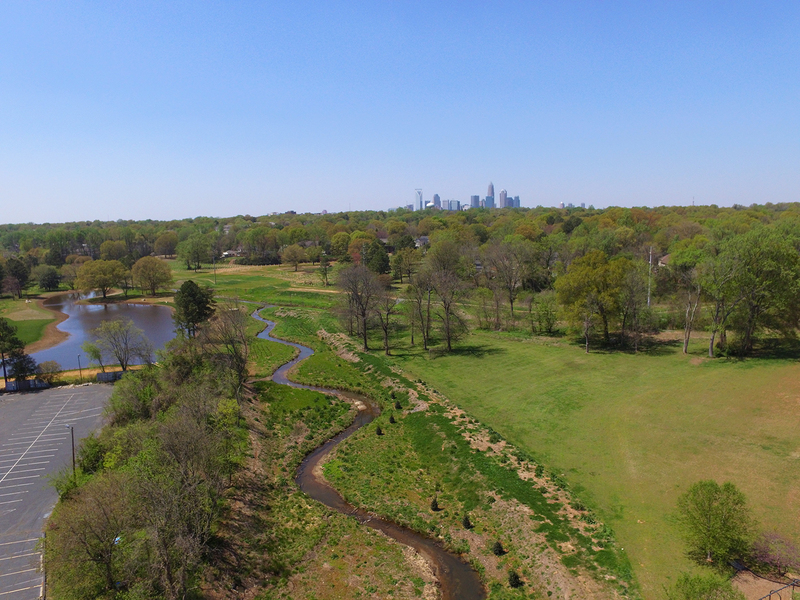 Check out this video that tells the story of restoring a portion of Torrence Creek at ‘The Park’ business park in Huntersville, NC. As the prime consultant, Wildlands Engineering provided assessment, design, permitting, natural channel design, hydraulic modeling, and bid phase assistance services. 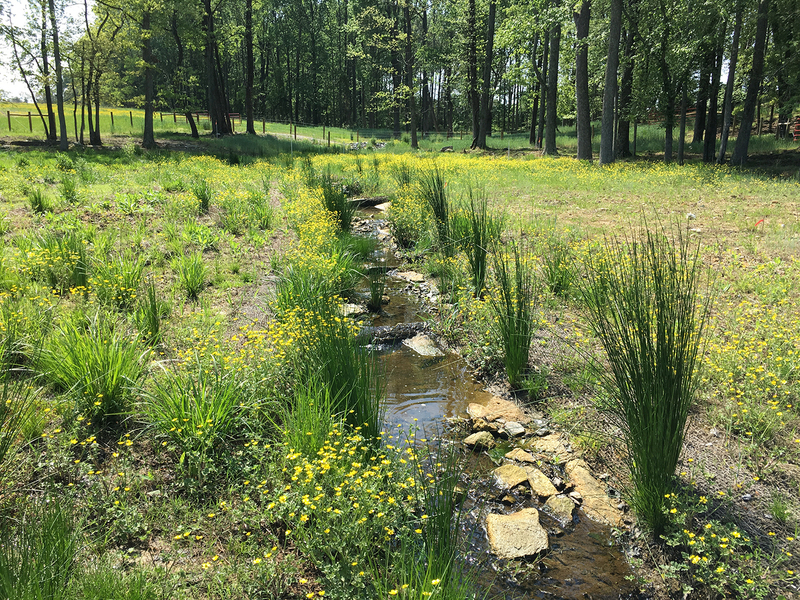 Wildlands Engineering has served as the lead engineering firm for the Chantilly Ecological Sanctuary project in Charlotte, NC. 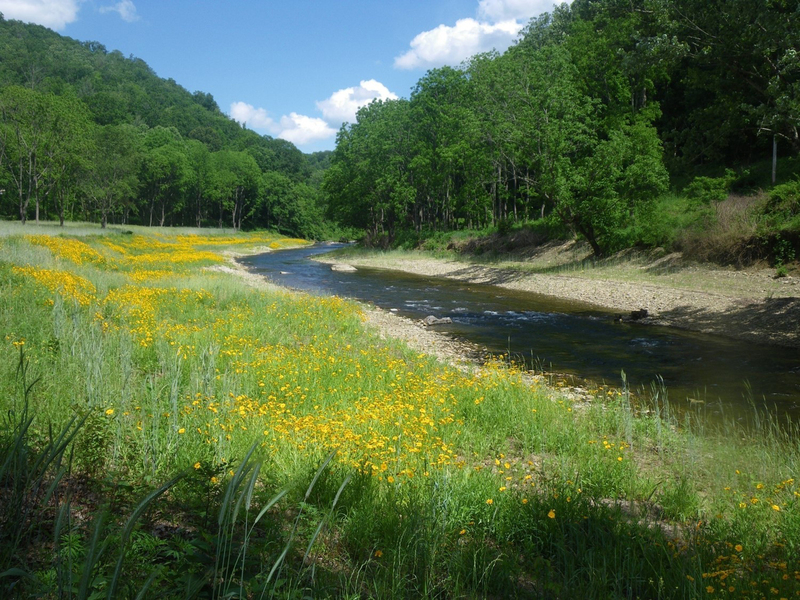 Our team completed design, permitting, easement procurement, public meetings, construction services, and modeling services for over 9,000 linear feet of stream and two storm water quality Best Management Practices (BMPs). Wildlands has recently completed work on the Cane River Dam Removal and Restoration Project. 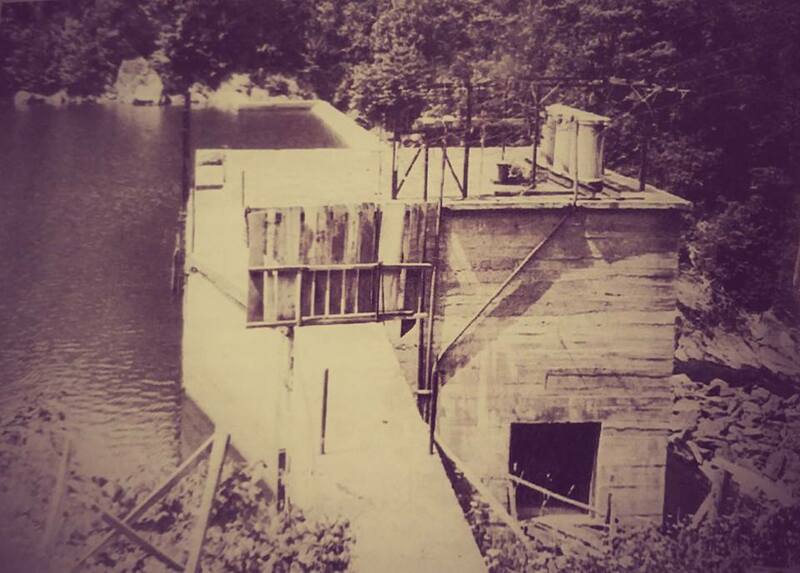 The Cane River dam was built in 1908 to generate hydroelectric power for Yancey County. The dam was a reinforced concrete structure measuring approximately 45 feet tall and spanning 245 feet across the valley. The dam and powerhouse were submerged during major floods in 1940 and the mid 1950’s. In the 1970’s, another significant flood caused even more damage and the dam was partially breached to prevent complete collapse. The dam was damaged again during Hurricanes Frances and Ivan in 2004 and remained in an unstable condition until the removal project came to fruition. Under a design-build contract through Blue Ridge RC&D Council and in coordination with a group of stakeholders that includes the US Fish and Wildlife Service and the NC Wildlife Resources Commission, Wildlands designed and Baker Grading & Landscaping constructed a dam removal and river restoration project for a one-half mile reach of river. The project goals included: removing the dam, powerhouse and much of the accumulated sediment; restoring river dimension, pattern and profile upstream and downstream of the dam; establishing robust riparian buffers; and restoring aquatic organism passage through the project reach. 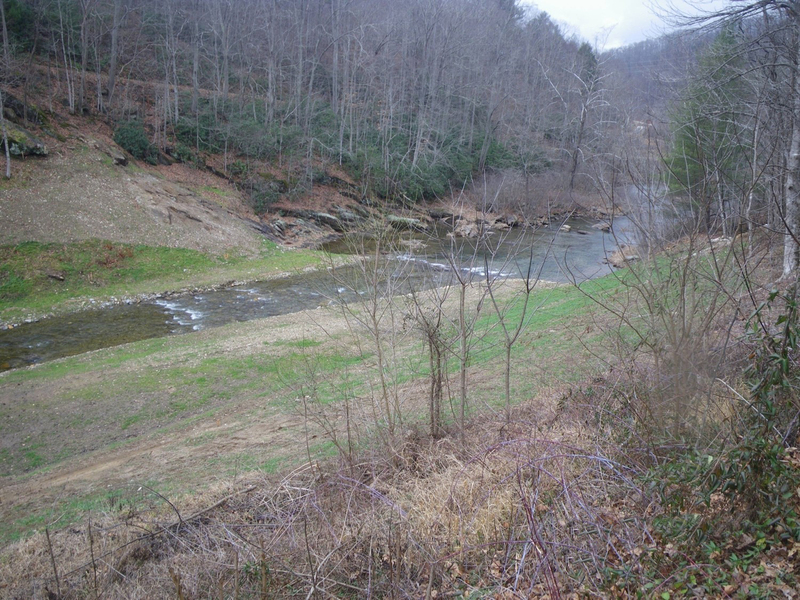 This reach of the Cane River is home to populations of the federally endangered Appalachian elktoe mussel and the Eastern hellbender, a state species of concern. The project design included wood and stone shelter structures and bed form modifications that support the life cycles of these animals and other native species. Construction was completed in October 2016. Wildlands is excited to be the lead design engineer and prime consultant for the 9-acre South Ellerbe Stormwater Project in Durham, NC. This project will not only be a wonderful community amenity, but it will remove up to 1000 pounds of nitrogen each year from Falls Lake. Watch the above video or CLICK HERE to learn more about the project. The next phase of our Reedy Creek Stream Restoration project gets approval. Wildlands’ completes construction on Candy Creek Stream Mitigation Project. Construction has recently been completed on Wildlands’ Candy Creek Stream Mitigation project in Guildford County, NC, south of the City of Reidsville. The project will provide 15,456 stream mitigation units (SMUs) on Candy Creek and nine of its tributaries in the Haw River Basin.The project will create significant ecological improvement through exclusion of cattle from the stream, restoration of aquatic and terrestrial habitats, and the removal of two farm ponds. 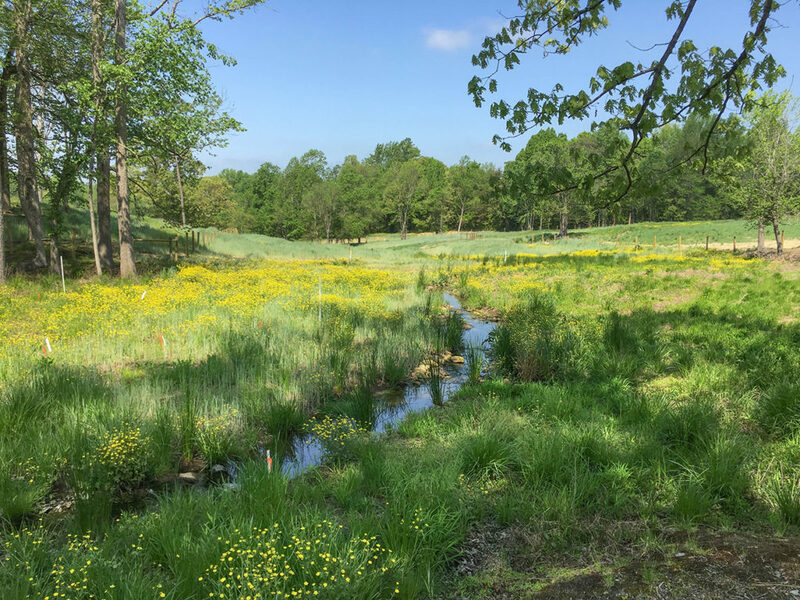 The project will also decrease nutrient and sediment loads from the watershed by eliminating widespread, severe bank erosion, connecting the onsite streams to their floodplains, and restoring native riparian buffers. 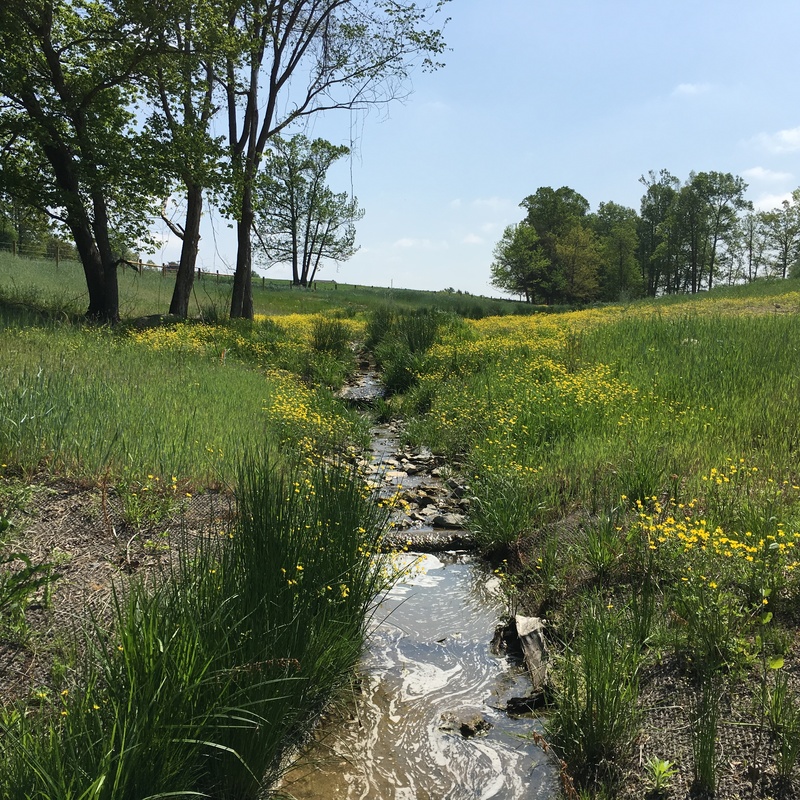 The project includes categorical exclusion documentation, existing conditions assessment, landowner coordination, conservation easement acquisition, stream restoration design, permitting, construction, and seven years of post-construction monitoring. Construction wraps up on our Vile Creek Stream and Wetland Mitigation Project. 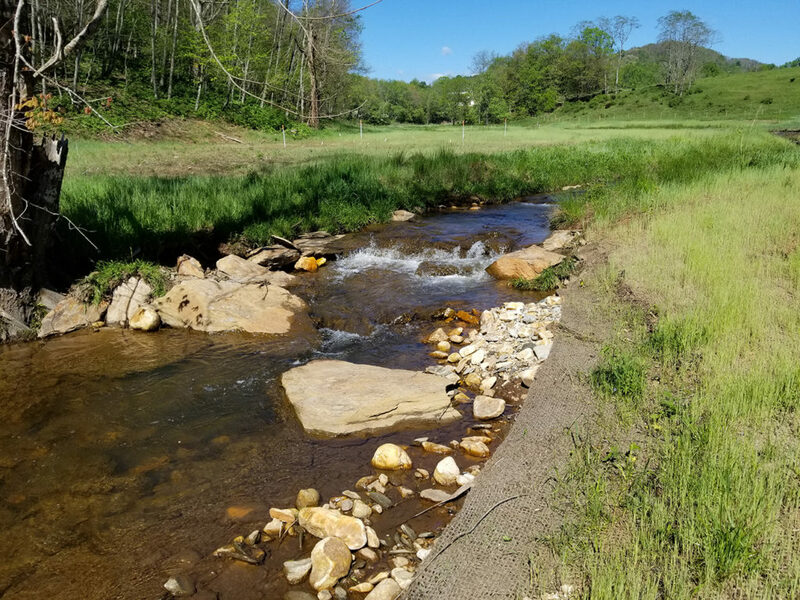 Wildlands is pleased to announce that construction is complete on the Vile Creek stream and wetland mitigation project in Alleghany County, NC. 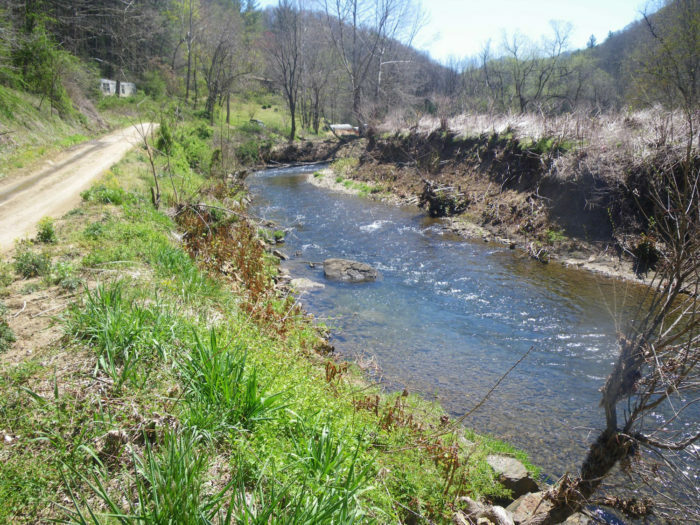 The project includes the restoration and enhancement of 7,900 feet of streams and restoration of 6.5 acres of wetlands. 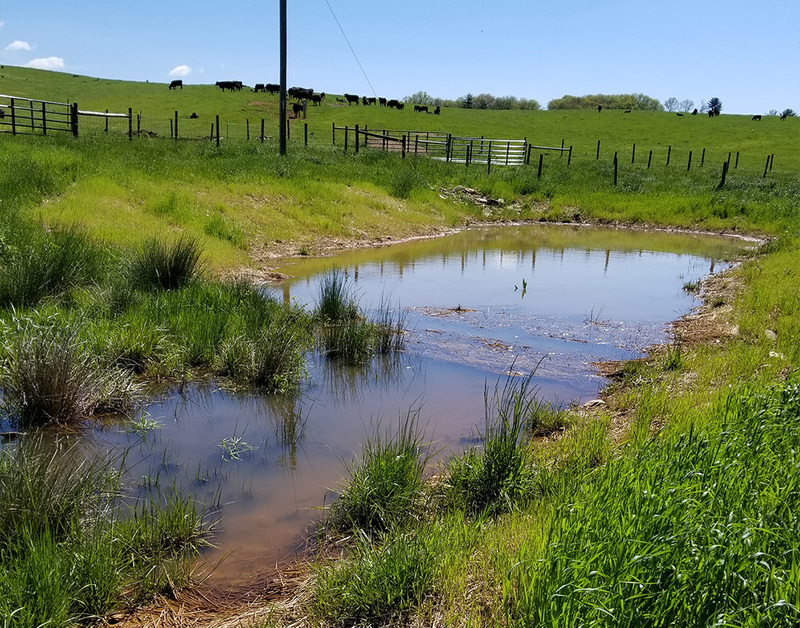 The wetlands restoration includes the expansion of Southern Appalachian Bog habitat which is intended to support populations of bog turtles (Glyptemys muhlenbergii). 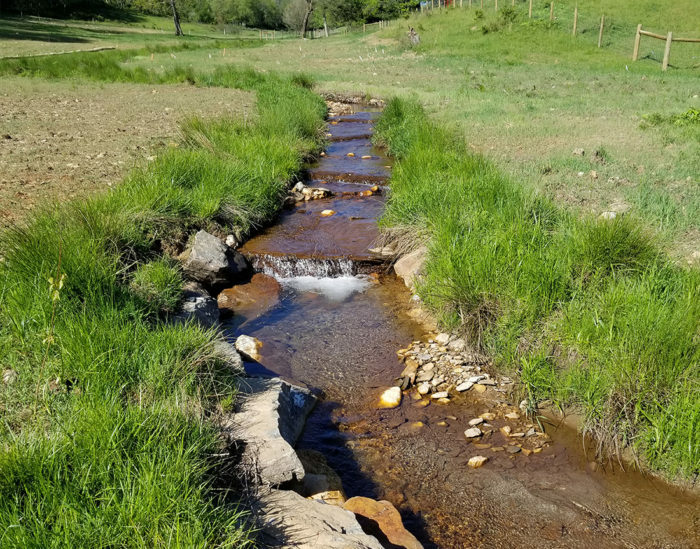 In addition, Vile Creek drains to Little River within the project conservation easement, which is a hatchery supported trout stream stocked by the North Carolina Wildlife Resources Commission (WRC). Vile Creek also holds trout which migrate from Little River and fish habitat was constructed as an element of the project. The floodplains and wetlands on the site were planted with native tree and shrub species. Shrubs were planted on much of the site so that the bog habitat areas will not be overly shaded. By closeout, the project will result in 5,146 stream mitigation units (SMUs) and 5.82 wetland mitigation units (WMUs).